Something amazing happened recently. Senate Republicans held together and gathered the support of of a few Democrats to shoot down the President’s plan to stop “tax cuts for the evil rich”… thus pursuing his class warfare agenda. Never mind the fact that keeping tax rates the same is not a cut. We are told the government has other uses for the money – as if it was theirs in the first place. It’s not surprising, with Senators like Jim DeMint and his cohorts, but the wicked witches of Maine and even Lindsey Graham and John McCain held together with the conservative core of the party. We can hope the the recent election results have either put the fear of the voters in the non-believers or actually made them believers. Our poor President was not the only one infuriated by this act of insubordination, so was his base… he was going to extend the tax cuts for some when he promised cuts for no one. However, he has something he thinks is a bargaining chip. Something he thinks he can get out of the Republicans if he must compromise with them. He knows his leftist base will accept not it if it appears he has caved to the opposition demands. He has told them that he will veto any bill that has tax cuts for every American – unless it contains an extension of the unemployment benefits. 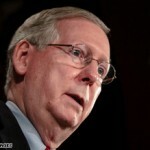 The Republicans can have the man on the ropes… and the leaders are talking about compromise! Now the extension of unemployment benefits is an entirely separate question that should be discussed on it’s own merits, or lack of same. Democrats are very good at playing the public relations game, the Republicans are very good at walking into their booby traps. It is time for things to change. The Dems are framing the issue as the Republicans holding the middle class hostage for the benefit of the evil rich… and the Senate leadership is letting them get away with it. They are being guilted into giving in on the unemployment extension which looks like it would add at least another $150 billion to the amount our children and grandchildren will have to pay off. Obama’s lap dog media is pushing the progressive party line, as usual, with the Rs as bad guys and the Ds good guys. The the Republican leadership in the Senate is accepting this narrative and behaving as if it were true! Apparently they have not learned anything. Have they not considered the possibility of passing the tax cut extension sans unemployment and putting the President in the position of having to veto the bill, making him the one to deny the middle class their tax cut extension. Have they not considered making him into the bad guy. Have they not considered doing the right thing and letting the responsibility hurting the constituents fall squarely on the anointed shoulders. On one hand… he may like the increase in confiscated funds, but on the other it would plainly put an end to his unemployment extension he thinks will help the country. Time after time, when faced with ultimatums by the ruling party, the Republicans blink and give them the victory. It is time to make put the shoe on the other foot. It’s time for the Republicans to flex their new found muscles and show that they are worthy of the recent victories. Apparently they have the votes to get the job done, but are afraid of what the President and his henchmen will do to them. It has been said the courage is the one virtue that insures all others. Without it, all the high sounding rhetoric is meaningless. Let Mitch McConnell and his fellow brahmin legislators put actions to the principles they say they hold. It’s time to put the gentlemanly sport of being a Senator on hold, forget the comity of the Senate and actually regain the concept of victory, which is the only one of consequence when dealing with a psychopathic administration bent on destroying our country.